Please note that this article applies to FME 2017 and prior. In FME 2018+, please consider using the Microsoft Word Writer and MSWordStyler transformer. Jan Bliki of the European Environment Agency (http://eea.europa.eu) was kind enough to share this clever workflow for creating Word documents with FME. Writing Word is possible because the .docx (Office Open XML) format is essentially a zipped folder of XML documents. Within the attached workspace and custom transformers Jan combines any required content into JSON snippets and then uses FME’s XMLTemplater and other XML transformers to structure and package the required content before zipping into a final .docx file. Use this example to create your own MS Word reports based on any data you want to read in FME. Download and unzip the attached file ValidationReporter.zip (click the link at the top of the article). Review the output Word file: <MicrosoftWordWriter>\wordTrial\demoNew.docx. The output file demonstrates and describes the possibilities of the workspace. Open the workspace <MicrosoftWordWriter>\MicrosoftWord.fmw in FME Workbench 2014 Sp2 or later. The Word Document is initiated and the top level heading paragraph is created with the MSWordInitiator custom transformer. Other paragraphs are included using MSWordParagraph custom transformers. In this example the text is hard-coded within each of the custom transformers and you can edit this text within the transformers or create User Parameter if would like to read this text from a source dataset attribute etc. A table is created using data read into FME from a CSV source dataset. 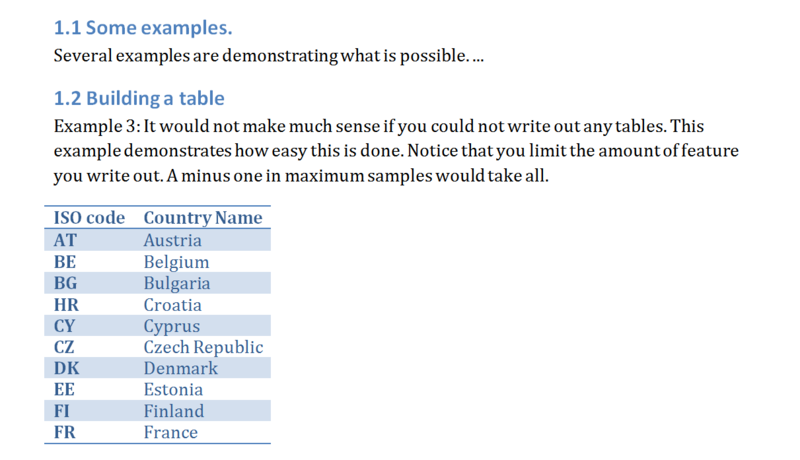 You can replace this reader with any other reader and use the MSWordTable custom transformer to define which attributes to use in your table. A bullet list is created from content in an attribute, again using the MSWordParagraph custom transformer. This customer transformer has a drop down for different Body Styles and in this case the style is Bullet List. 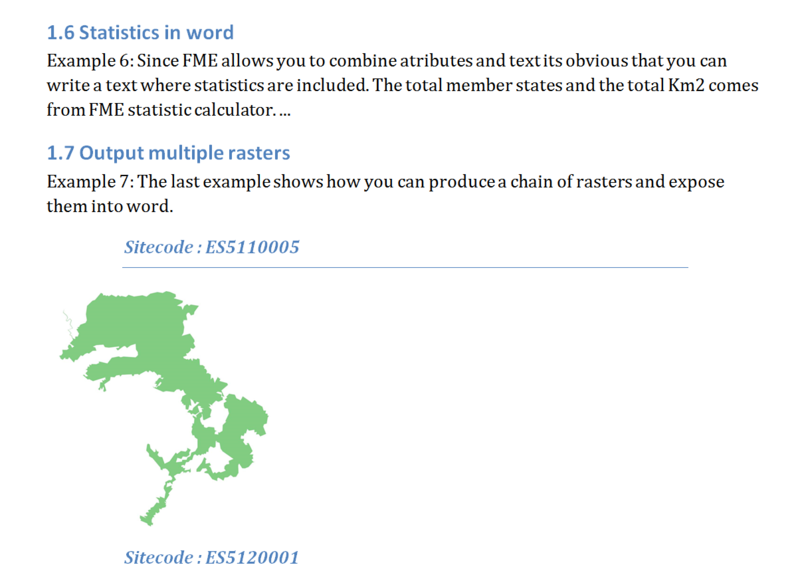 The MSWordRaster custom transformer is used to include a raster feature in the Word file and the raster can be either read or created within FME. In this case the MapnikRasterizer is creating raster a raster feature from a Spatialite vector data source. Statistics can be included within paragraph text, again using the MSWordParagraph custom transformer and embedded FME attributes. The last bookmark shows how to produce a series of rasters and include them in the Word document. Use File > Prompt and Run to ensure your source and destination file paths are correct and run the workspace. Examine the output Word file which should be written here: <MicrosoftWordWriter>wordTrial\demoNew.docx. Thank-you very much to Jan Bliki of the European Environment Agency (http://eea.europa.eu) for sharing this example. Jan also mentioned that receiving FME Training from our Gold Level Value Added Reseller Sweco (www.sweco-fme.com) was very effective in getting his team going with FME. Very impressive! Any idea if it is possible to specify headers and footers? Ken, is there a way we could write the text in paragraph from right to left? In FME 2018 (and since FME 2017) we have had an MSWordStyler and MSWord Writer in FME. In the MSWordStyler you have the option to set an attribute or enter text for various parts of the file. In either case if the text is encoded in a right to left writing system such as Arabic then we will write it to MS Word as right to left. Also in the MSWordStyler when you select the font in the font dialog you can select a Writing System. If you choose Arabic for example then you will have right to left to text in the output. Hi @boubcher, It would be great if you can share a short video that demonstrate what you see. I'm having some trouble envisioning the issue you are describing. Thank you very much!